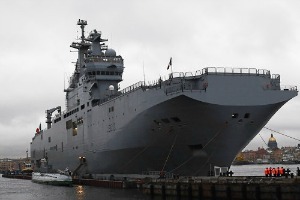 Russian seamen are training in France on the amphibious assault ships which will be delivered by the end of the year under a €1.2 billion deal signed in 2011. A few hundred Ukrainians protested against the deal outside a museum in Kyiv yesterday (14 July), where Bastille Day was being celebrated. “Requirements for the supply of the military weapons to third countries enshrined in the EU Code of Conduct on Arms Exports from 1998, which in 2008 were confirmed in the relevant EU Council Common Position“, Yielisieiev told the Ukrinform agency. The diplomat argued that the issue couldn’t be considered in the context of the so called third level of sanctions against Russia, as the contract violates the basic rules of the European Union. The present “second level” of EU sanctions against Russia focuses on freezing assets and restricting travel of key officials, the “third level” including economic sanctions. The “third level” would be decided at the level of EU heads of state and government, in the case of major transgressions by Russia, such as the outright crossing of borders, with military force. Yelisieiev said that the Mistral contract could be challenged by EU courts. “Such a contract would have to be reviewed yesterday, based on the requirements of EU legislation. Thus, the contract […] could potentially be considered by the courts, ” said Yelisieiev. The diplomat argued that even without the detailed analysis of the EU legislation, the war in Georgia in August 2008, the annexation of the Crimea and Russia’s destabilizing campaigns in the eastern regions of Ukraine are clear evidence of non-compliance behavior of the Russian side, with at least three of eight criteria of the mentioned rules. “For example, at the conclusion of a contract for the supply of arms EU member states should take into account the risk of using such weapons against neighboring countries, in particular for the territorial claims,” said Yelisieiev. According to the Ukrainian diplomat, the decision to supply sophisticated weapon to the country that imposes territorial claims against neighboring countries and “virtually destroyed the system of international law”, is quite controversial. Ukrinform: ???????? ????? ??? «???????? ?» ????? ???? ?? ????? - ??????? It is quite too early for Kiev to interpret the EU rules and to instruct Old EU Member States (e.g. France) in such a rude moralising manner. Cannot understand this ! Why is France still selling war assets to Russia ?!!! As an evidence (Pro) Russian separatist have already shot down a civilian plane with European aboard !! It could be possible to fight against own weapons too but that doesn’t matter !